If you haven’t caught on yet, the Assholes are on vacation! Matt, Jay & Sean are in California for the week, and today we’re in sunny San Francisco, possibly on the ferry right this very minute on our way to visit Alcatraz. Because movies are the only homework we know, we prepped for this vacation for watching anything that gave us a glimpse of the monuments we planned to visit, and today’s theme was a no-brainer. Alcatraz island, also known as the rock, was home to a federal prison from 1933-1963. At the time the movie The Rock was made, the island was already a tourist hotspot, allowing tourists to explore the prison and sit in the cells where the worst and most violent prisoners were held, and from whence no one ever successfully escaped. Or did they? 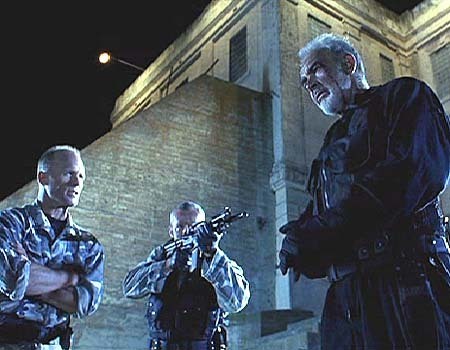 In The Rock, Sean Connery plays a convict and the one unofficial escapee. When a group of crazed rogue Marines take over the prison and claim 81 tourists as hostages, Connery is tapped to help coordinate the police mission to win the prison back. In the end it falls to him and to weiner-chemist Nicolas Cage to save the day. The prison (in real life) was very expensive to operate and locals were complaining about the sewage attributed to the inmates, so the facility was closed down. Today the whole island is a National Historical Landmark and we’re reasonably confident that hostage situations no longer arise, and if they do, they’ll have the foresight to pick on a later tour group. During filming, Sean Connery didn’t want to travel back and forth to the mainland so he had a cottage built on the island to accommodate him. Later, the film’s premiere was held in the prison’s rec yard. The island had remained open to the public during filming, so I suppose the tourists had a little something to keep them entertained while waiting in line (unless it was a Cage scene, in which case I’m sure they asked for their money back). This is Michael Bay’s favourite Michael Bay film, and the only one in his whole repertoire certified fresh on Rotten Tomatoes. Quentin Tarantino was an uncredited writer on the script. And Arnold Schwarzenegger was offered either Cage’s or Connery’s role, depending who you ask, but in any case turned it down, and lived to regret it. Later tonight, Sean and I are going to a Giants game where Sean will likely drink a Pabst Blue Ribbon and I’ll cheer for mustard in the hot dog race, we’ll watch a little baseball, and no one will show up to stalk and\or stab any of the players. The Fan came out the same year as The Rock (1996), what a boon for San Francisco! 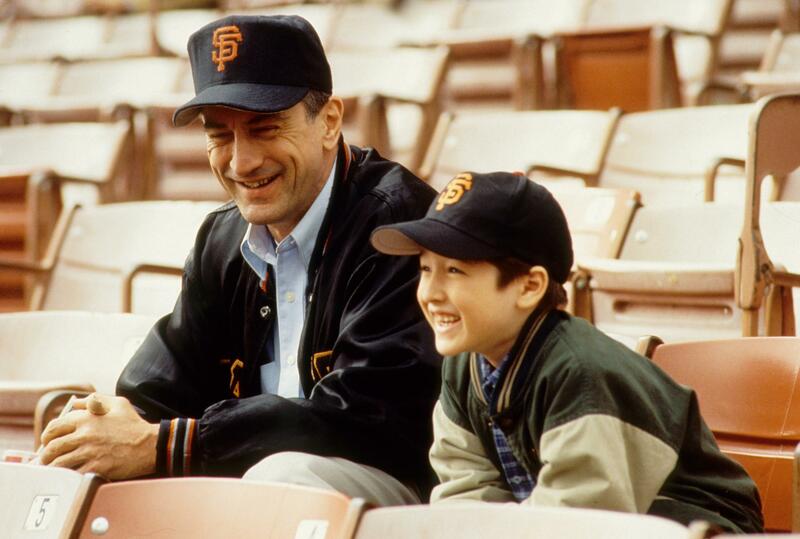 Robert De Niro plays the degenerate fan and Wesley Snipes the star player who inspires De Niro’s fanaticism. It’s not a great movie and also not a great comfort if these are possibly the kinds of fans we might encounter tonight. Anyway, if a disgruntled knife salesman does get stabby, then I guess we’re out of luck, with little else than a witty Hunter Pence poster to defend ourselves with (and last time I checked, scissors beat paper). A natural disaster, however, we can handle. The other The Rock (as in Dwayne Johnson) showed is in San Andreas just how sturdy this stadium is – AT&T Park is immovable, come hell or high water, and of course both those things come in spades during the course of this disasteriest of disaster movies. Annnnyway, I’m sure San Francisco is nothing like the movies. I’m sure it’s much more like an episode of Full House! This entry was posted in Jay and tagged Quentin Tarantino, Robert DeNiro on July 11, 2015 by Jay. I’d love to visit San Francisco in the future. Hope you’re having an ace time. Then I’m sorry to report a SFG win! Fantastic! Wishing you three a wonderful time!